A visit to the gardens at Manley Hall was a wonderful experience. Forty-four greenhouses traveled the spectrum of the whole plant kingdom — with winding walks and waterfalls as in a rich tropical valley of ferns, or stepping stones for walkways that connected a wonderland of artificial lakes filled with aquatic plants. Everything luxuriated in palms, cycads, and beautiful-leaved plants, but there was also a greenhouse full of flowering azaleas surrounded by beds of pansies. Orchids were the specialty at Manley Hall, and the collection was a showcase of the finest orchid species and varieties of the day. The Cattleya species were particular favorites and when a representative of The Gardener’s Chronicle visited Manley Hall in the spring of 1871, he commented with admiration on a large dark Cattleya mossiae ‘Manley Hall’ with 16 flowers. When The Floral Magazine visited Manley Hall the following year, they wrote about a magnificent new Cattleya species that would excite the interest of the whole horticultural world for decades to come. Manley Hall was the estate and residence of Samuel Mendel Esq., the “Cotton God” of Manchester, England. Mendel was a true friend of horticulture who opened his gardens and greenhouses free to the public. He was also a good customer of the orchid firm James Backhouse & Sons of York, and when Backhouse received a shipment of a new Cattleya species from its collector in South America, Mendel purchased the plants for his collection. The excitement of owning a new, unnamed Cattleya species was almost too much for poor Samuel Mendel, who instructed his superintendent, Mr. Petch, to awaken him at any hour of the night when the flowers began to open. Petch obligingly called Mendel at 4 am when the great event occurred and Mendel rushed to the greenhouse in dressing gown and slippers, and is reported to have stood for a long time in awe of the new discovery. In its 1872 article on a visit to Manley Hall, The Floral Magazine called the new Cattleya species Cattleya mendeli (with one “i”), a name given to them by Petch. Who actually named the plant, however, is still a mystery, because Backhouse sold the plants to Mendel as just an unknown Cattleya species. Cattleya mendelii was first imported into England in 1870 by two British orchid firms, Messrs. Hugh Low & Co. of Clapton and Messrs. James Backhouse & Sons of York. It first flowered in 1871 in the collection of John Day of Tottenham from plants imported by Low. It was Backhouse’s plants, however, in the collection of Mendel, that received all the publicity, the recognition, and the name. It is difficult to know who to credit with the first botanical description of C. mendelii because the species was accepted by horticulturists so quickly that it became a well-established species without anyone’s having formally described it. The Floral Magazine essentially wrote a news item about it in 1872 (t. 32), in which they published a black-and-white picture of a pseudobulb, a leaf, and one flower with a description of the flower’s color. The picture clearly shows the distinctive features of C. mendelii’s flowers and The Floral Magazine article is sometimes given as the first publication for the species. As a news item, however, the article had no author, so for want of one, Backhouse’s name is often used even though he never named the species. Another common reference gives the year 1870 for the first botanical description in the 6th Edition of Williams’ Orchid Grower’s Manual — a truly grand faux pas that originated with Veitch in his Manual of Orchidaceous Plants. Unfortunately for Veitch, the 6th edition wasn’t published until 1885 — 15 years after C. mendelii was supposed to have been described in it. The 4th edition, published in 1871, did not even mention C. mendelii, and the 5th edition, published in 1877, described C. mendelii, but not as well as The Floral Magazine had five years earlier. Low sent the first flowers of C. mendelii to the botanist H.G. Reichenbach in 1871, but Reichenbach apparently considered them a fine form of Cattleya trianaei at the time, so he did not describe them as a new species. Reichenbach did eventually publish a proper description in Sander’s Reichenbachia in 1888, crediting himself with the name, but Jean Linden had already published a fine description three years earlier in 1885 in his Lindenia, spelling the name “Mendeli” as The Floral Magazine had done. When I first learned to raise orchids in the early 1940s, the old English estate growers who taught me to grow them were always praising C. mendelii. They talked about its beautiful contrasting colors — very pale lavender sepals and petals against a rich purple lip. They spoke about C. mendelii’s very wide petals and large, 8-inch flowers, and how well the flowers were presented on the plants. These English growers were in their mid-60s when I knew them, so they themselves were young men learning about orchids in the 1890s when the Cattleya species were the gems of the orchid world. Cattleya mendelii was obviously a crown jewel. The many C. mendelii I have seen over the years have been charming spring-blooming plants. They had medium-sized 5- to 6-inch flowers with relatively good shape. Their sepals and petals were very pale lavender, sometimes white, and the lip varied from pale to rich dark lavender, and most clones had a distinctive striping radiating down the center of the lip. These C. mendelii were even grown for cut flowers in the early days of the cut-flower industry, but were rapidly replaced by darker lavender species like Cattleya mossiae as florist’s tastes turned to darker flowers. None of these C. mendelii, however, were the wide-petaled giants of the 1880s and 1890s. If such splendid C. mendelii had existed, I wondered what happened to them. It is clear today that the first C. mendelii imported into Europe in the late 1800s were an unusually fine strain of the species. Because of this, they were the collector’s favorites and the hybridizer’s first choice in breeding. These C. mendelii were the parents of many of our early Cattleya hybrids, including some of the most outstanding hybrids ever produced. These early C. mendelii hybrids often had very large, round flowers. Brassocattleya British Queen (Bc. Digbyano-Mendelii x C. Lord Rothschild) was one such hybrid that had enormous flowers with wide, overlapping petals. 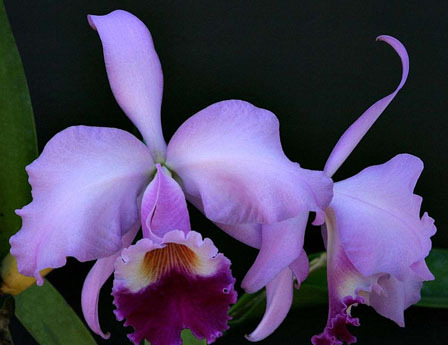 One of the parents, the primary cross Brassocattleya Digbyano-mendelii, itself received four First Class Certificates and two Awards of Merit from the Royal Horticultural Society for its fine flowers. Many of C. mendelii’s other primary hybrids also had large, round flowers, particularly Cattleya Atlantic (mendelii x trianaei), and Cattleya Armainvillierensis (mendelii x warscewiczii). Eileen Low, one of the foremost Cat-tleya breeders of all time, could not say enough good things about C. mendelii. She felt the species contributed both good shape and good carriage to its hybrids, an unusual combination and one that is sorely needed in many of our modern complex Cattleya hybrids. She felt C. mendelii increased the size and improved the shape of Cattleya hybrids without unduly affecting the color of the other parent. Cattleya mendelii was the parent used to increase the size and shape of Cattleya intermedia ‘Aquinii’ to produce the splashed-petaled Cattleya Suavior ‘Aquinii’ in 1930. It was the parent of the best red-colored primary hybrid, Sophrocattleya Thwaitesii (C. mendelii x Soph. coccinea), which had better shape, size, and a clearer red color than Sophrocattleya Doris (C. dowiana x Soph. coccinea). The delicate coloring of C. mendelii’s sepals and petals contribute significantly to its beauty by magnifying the lovely color of the labellum, whether it is an intense rich purple or a pastel shade of lavender. The Royal Horticultural Society in London has given 16 First Class Certificates and more than 30 Awards of Merit to C. mendelii and most flowers exhibited had this beautiful contrast between the lip and the sepals and petals. 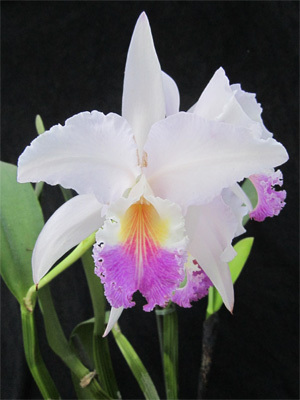 A considerable number of plants awarded have had white sepals and petals and lavender labellums, and C. mendelii has more semialba clones than any other of the Cattleya species. Despite the large number of semialba clones, however, very few true albas have been found. The two best-known albas were both imported by Low. The first one, C. mendelii ‘Bluntii’, FCC/RHS, was named for Low’s collector who found the plant. The other, C. mendelii ‘Stuart Low’, FCC/RHS, was an 8-inch giant with wide petals that is usually considered the finest alba clone of the species. Surprisingly, ‘Stuart Low’ was still available commercially as late as 1950. Another famous old clone that is still found in private collections is the lovely semialba C. mendelii ‘Thule’, AM/RHS, which has a pale pinkish tint to the lip that gives it an enchanting appearance. Relatively few dark-petaled clones of C. mendelii have been found, and these have seldom been as beautiful as those with pastel sepals and petals and a contrasting darker lip. Cattleya mendelii also has flowers of relatively thin substance, which adds to their delicate beauty. Cattleya mendelii is native to Colombia, where it grows at an altitude of 2,500 to 3,500 feet in the Eastern Cordillera. Plants imported in the late 1800s were reported to have come from an area lying between Pamplona and Bucaramanga, often growing on exposed precipices and bare rocks. The history of the species, however, is painfully clear. Frederick Sander complained that, in the 1880s, his collectors in Colombia could send him 200 cases of C. mendelii when he asked for them, but by 1890, they could only send him one or two cases, and sometimes they even had to buy plants collected and cultivated by native Colombians as their own garden plants. The grand old strain of C. mendelii that made the species famous and contributed so much to early Cattleya hybrids disappeared because the native habitat was literally stripped of all the plants, even down to the few specimens that adorned the houses of those who lived there. The old lavender clones of C. mendelii that were in cultivation slowly disappeared, as the fashion for dark-petaled Cattleya hybrids emerged and they could no longer be replaced from the jungles. The grand old monarch simply vanished, and only the colored parchments from the past remain to remind us of its majesty. Will it ever appear again? Perhaps. But we have waited 100 years already for this to happen. We can only hope that somewhere, in an obscure corner of the vast Colombian rainforests, the genes of that magnificent strain of C. mendelii still linger and, with still more time, these giants of the past may reappear to grace the orchid world as they did in the late 1800s, during the golden age of the Cattleya species. Until then, we can still enjoy the few C. mendelii that remain in cultivation, for they are among the loveliest of the large-flowered Cattleya species that exist anywhere. They are a collector’s treasure and a grower’s delight. Cattleya mendelii is probably the easiest of all the Cattleya species to grow. It is a vigorous grower and a reliable producer of three or four flowers per flower stem each spring. It is more resistant to rot than most other Cattleya species and roots freely. Cattleya mendelii normally flowers in April and May in the United States and remains in bloom for several weeks. It begins its new growth in midsummer and completes the growth by late autumn. It can make two growths a season under good growing conditions. When the new growth is completed, C. mendelii will rest until buds begin to form in the sheath in February or March. The plants should be watered less during the winter months to avoid damaging the roots. Plants grow and flower best with a good amount of sun and air. They benefit from normal cattleya temperatures of 58 F to 60 F at night and 80 F to 85 F during the day.